Astrocytes are star shaped supportive cells that help brain cells (neurons) function. These are the most common cellular component of the brain. The most common type of glial cell is an astrocyte and an astrocytoma is a type of glial tumor arising from these cell types. Astrocytomas are the most common glioma, accounting for about half of all primary brain and spinal cord tumors. They may occur in many parts of the brain, but most commonly in the cerebrum. They occur less commonly in the spinal cord. People of all ages can develop astrocytomas, but they are more prevalent in adults, particularly middle-aged men. Other types of gliomas include oligodendroglioma and ependymoma.Pilocytic astrocytomas, the most benign (non cancerous) variant, are rare and found almost exclusively in children and young adults. On the other end of the spectrum is the glioblastoma—one of the most malignant (cancerous) tumor types found in the body. 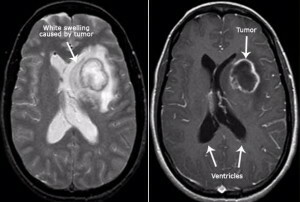 This tumor is very fast growing, so much so that they multiply in a matter of a few hours to twice their original size. Notorious for coming back after presently available treatment, these are challenging both for neurosurgeons and patients family. Treatment options depend on such factors as age, tumor location, size, and histopathological grade. There are different types of astrocytomas, and these lesions are classified into several categories according to their appearance under a microscope. This classification is of paramount interest because, the grade of an astrocytoma will often predict its behavior and, therefore, a patient’s prognosis. Astrocytomas are generally classified (graded) into one of three types: Low grade astrocytomas, anaplastic astrocytomas and glioblastoma multiforme. Low grade astrocytomas account for 10 percent of all astrocytomas. These tumors are typically slow growing. These are called ‘benign’ tumors. However, over a period of time, these tumors often advance into the higher grades of brain gliomas therefore becoming dangerous. Anaplastic astrocytomas and glioblastoma multiforme are the most aggressive and called ‘malignant’ tumors. Unfortunately, the most common astrocytomas. Glioblastoma multiforme are fast growing astrocytomas that contain areas of dead tumor cells. In adults, glioblastoma occurs most often in the cerebrum, especially in the frontal and temporal lobes of the brain. Diagnostic tools include computed tomography (CT or CAT scan) and magnetic resonance imaging (MRI). Magnetic resonance imaging (MRI) is the most sensitive and best method of detecting brain tumors. Magnetic resonance spectroscopy (MRS) is used to study the tumor’s chemical profile and determine the nature of the lesions seen on the MRI. Positron emission tomography (PET scan) can help detect recurring brain tumors. Treatment options include surgery, radiation, radiosurgery, and chemotherapy in various combinations and permutations. 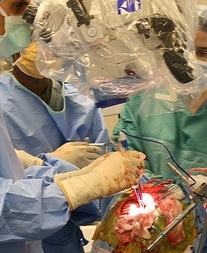 The main goal of surgery is to remove as much of the tumor as possible (Debulking ) without injuring brain tissue needed for neurological function (such as the ability to speak, walk, motor skills, etc.). usually benign tumors can be removed in total. However, high-grade tumors often have tentacle-like structures that invade surrounding tissues, making it more difficult to remove the entire tumor. If the tumor cannot be completely removed, surgery can still reduce or control tumor size.Almost always necessary in order to obtain a piece of tumor tissue for grading, surgery also can be used to remove the mass effect and pressure caused by the tumor. 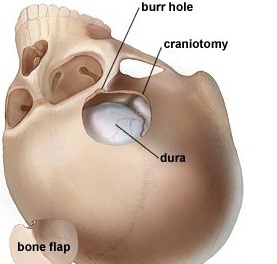 In most cases, surgeons open the skull through a opening (craniotomy) to best access the tumor site. The goal of radiation therapy is to selectively kill tumor cells while leaving normal brain tissue unharmed. In standard external beam radiation therapy, multiple treatments of standard-dose “fractions” of radiation are applied to the brain. Each treatment induces damage to both healthy and normal tissue. By the time the next treatment is given, most of the normal cells have repaired the damage, but the tumor tissue has not. This process is repeated for a total of 10 to 30 treatments, depending on the type of tumor. This additional treatment provides some patients with improved outcomes and longer survival rates. Patients undergoing chemotherapy are administered special drugs designed to kill tumor cells. Although chemotherapy may improve overall survival in patients with the most malignant primary brain tumors. Chemotherapy is often used in young children instead of radiation, as radiation may have negative effects on the developing brain. The decision to prescribe this treatment is based on a patient’s overall health, type of tumor, and extent of the cancer. Before considering chemotherapy, you should discuss it with your doctor, as there are many side effects. Because traditional treatment modalities are unlikely to result in a prolonged remission of malignant astrocytomas, researchers are presently investigating a number of promising new treatments including gene therapy, highly focused radiation therapy, immunotherapy and novel chemotherapies. A number of new treatments are being made available on an investigational basis at centers specializing in brain tumor therapies.Several clinical studies demonstrate that the extent of tumor resection correlates with outcome for both low- and high-grade astrocytomas. However, benefit occurs only when more that 98 percent of the tumor visible on MRI was removed.